Focus, dedication, and a commitment to service is taking one DeKalb County School District (DCSD) to “the happiest place in Earth” and beyond. Tucker High School sophomore Sean Hanford was recently selected as one of 100 high school students nationwide to take part in the Disney Dreamers Academy. Hanford was chosen among 10,000 applicants throughout the United States. As an honoree, Hanford will take part in a four-day trip to the Walt Disney World Resort in Orlando, Fla., in late March 2019. While there, he will have the opportunity to network with some of the country’s top business leaders; hear from inspirational speakers; and take part in a wide array of career-oriented activities, including animation, journalism, zoology, entrepreneurship, culinary arts, and more. “It feels amazing; the opportunity to be selected out of 10,000 people is a really big deal,” Hanford said. Hanford currently boasts a 3.7 grade point average, is a member of the National Beta Honor Society, and is an honor student at Tucker High. While he has always been an academically adept and science, technology, engineering, and mathematics (STEM) oriented student, Hanford’s involvement in the Steve & Marjorie Harvey Foundation sets him apart from other students his age. Since last year, as part of his work with the foundation, Hanford joins others in taking part in community service throughout metro Atlanta. The foundation has also allowed him to serve as a mentor to boys enrolled in the program. 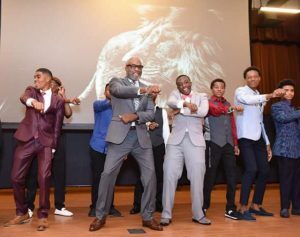 In 2018, Hanford was chosen by his peers and mentors to receive the Rising Star Award out of 200 other young men at the Steve Harvey Mentoring Camp for Boys which was held in Atlanta, Georgia. As an award-winner, he traveled as a Junior Ambassador to the Steve Harvey Sand & Soul Festival and Celebrity Golf Tournament in Punta Cana, Dominican Republic for Labor Day weekend. Hanford was also a production assistant at the Marjorie Harvey’s Girls Who Rule the World Camp and was featured on the The Steve Harvey Show’s, “Thank You Steve” tribute which aired in November. .
His experiences served as great inspiration for his five required essays to the Disney Dreamers Academy. Hanford focused on the vision he has for his life and what he would like to accomplish. Without hesitation, Hanford knows exactly what he wants—an aspect he feels stood out to judges. After a quick glance at Hanford—who’s a lean, athletic 6’2″ teen—one would not immediately guess he has ever felt threatened or in danger at school. However, an incident in middle school led to him pursuing mixed martial arts. Today, he’s a member of Tucker High’s varsity wrestling team. Hanford credits the sport with instilling in him a lasting sense of focus, confidence, and discipline. Similarly, Hanford became hooked on coding HTML at an early age when his next door neighbor showed him a few tricks and shortcuts. Hanford enjoys many aspects of emerging technologies. When he’s not training, he enjoys building personal computers from the ground up and trying his own hand at coding. He hopes to perhaps join the Tucker Robotics Team sometime in the near future. Finding pursuable passions and making them a requirement in his future are what keeps Hanford on track. Per the advice of Steve Harvey, he keeps a dream book outlining every want or desire, ranging from the outlandish to ordinary. Some examples yet to be achieved include purchasing a Bentley or traveling to Europe. Others, which he has already achieved, include being interviewed on television and traveling outside the United States. Hanford has even written down desired grades and grade point averages—both of which have already become a reality. While still a sophomore at Tucker, Hanford remains focused on the future. 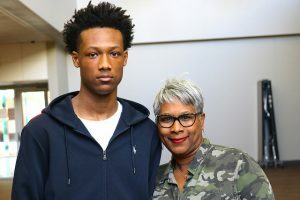 His dream schools—should his path to the UFC be diverted—are currently Georgia Tech and the United States Military Academy at West Point, where he plans to major in a STEM-related field.